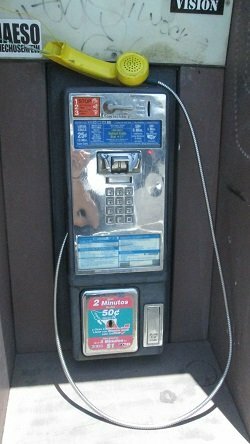 Alex Hughes –Payphone- Call #2.. June 2018..I was on my way to drop off some paint at Vista Paint over on the Shadowridge area of town and found a pay phone. I have been documenting a few over the last few months to see what condition they are in. This one caught my attention at the Albertaco’s Mexican Food by the 78. It is a small location in the corner of a shopping center with Vista Paint and Domino’s. The pay phone was located at the front of the store next to the entrance. As I walked up, I knew that this had been the victim of tagging and several stickers. The sides were effected along with the face of the phone stand. Some stickers had represented companies along with stickers with the names of familiar individuals whom I have seen elsewhere in Vista. They sure must be travelling a lot to leave their mark! The stickers on the sides consisted of a USPS Priority Mail label along with what appeared to be marker and crayon scribbled on. There were also a few letter stickers that spelled out “NHQ”. I honestly am not aware of what this means or symbolizes. restaurant as one would think. Search for this term on Instagram and you will be shocked at what comes up! 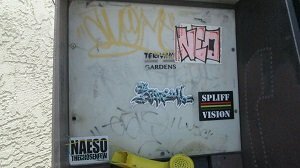 There was also a sticker that stated “Spliff Vision” which references the effects that marijuana would have on your sensory abilities. 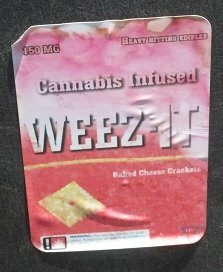 Lastly, I wanted to mention a sticker towards the bottom left of the stand that shows “Weezits” which is a parody of the popular snacks “Cheez-Its” except these snacks are marijuana edibles. They have been laced with high-THC concentrates to give an extra hit. I want to know more about these people who post these stickers around out cities. Where do they get them and why do they put it on our pay phones. Clearly, some of these people are definitely interested in marijuana culture given the many weed-themed stickers. As for the phone, it could not be used. I was not going to stick electrical tubes into my ear and make a call! You would only be able to speak and not listen to what the other party has to say. Sounds like a great lesson to us. We need to do both in order to get a better understanding of one another.